In Subsonic 3, the Registration class will have a property called â€œBeach_Teamsâ€ which returns a IQueryable<Beach_Team> collection. So, what can I do ? It do the job ! But if I want to regenerate the ActiveRecord.cs file, my modification will be lost ! So the good solution is to modify the T4 template to generate this property. Go to the ActiveRecord.tt file and search for ‘ Foreign Keys ‘. In a nutshell, for each tables linked to the table we are on, we check if the access code to the table has to be generated (see my previous article : Subsonic : Specify the tables you really need ! ). If the code has to be generated, we create a string variable named â€œpropNameâ€ which will be the name of the property. If this property already exists, we suffix the name to be sure we don’t have the same property twice. Then we generate the IQueryable property. Now, the first thing we want is to have the property name equals to the object name. But what if we have two foreign keys to the same table ? We will have the same property twice! and we have to avoid it! So, we have to check if this property isnâ€™t already generated. Now I can use the linked object directly ! You can donwload my T4 templates here. Subsonic : Specify the tables you really need ! 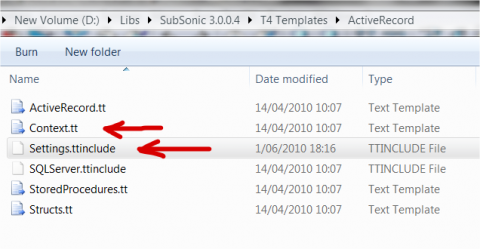 With the Subsonic’s T4 Templates you can specify the tables you don’t want the access code to be generated. But what if you want to choose the tables for which the mapping classes will be created ? Actually you can have many reasons to do that : having an application using only specific tables from a big system or having the ability to separate distinct parts of a system by example. In my case I wanted to use only three tables from my database to build an ASP.NET membership provider. This is the example I’ll use for this article. Now I want to generate the DAL layer only for these tables, so I create a new code library project, a add an app.config file containing the connection string and add the Subsonic.Core reference. The I have to add my T4 template, but they are not ready. I have to modify them to allow the selection of my tables. The simplest option would be to replace the “ExcludeTables” array by “IncludeTables” and to remove the logical NOT operator (!) in the conditions and the job will be done. But if we think a bit, we realize that there is many ways to choose the tables we want. CreateÂ a “â€œIsTableOkToBeIncluded” method taking care of the choice we made in the activerecord file and returning whether or not the table is ok to be generated. Now specify the Namespace, ConnectionStringName and DatabaseName in the Settings.ttinclude file. You can download my templates here. The Subsonic version I use is 3.0.0.4. I’m running Windows 7 64 bits and I hadÂ unblock the files in windows explorer. I had to run Visual Studio as an administrator. If you are not familiar with subsonic, I invite you to watch the 5 minute demo and read the startup tutorial from the subsonicproject website.